Resolving the problem of an unstable retaining wall before the school construction grant expires was a main topic of discussion at the Genoa-Hugo Board of Education meeting Monday, Nov. 16. The retaining wall, located next of the Genoa-Hugo School’s main entrance and visitor’s parking lot, has been concern since the completion of the Genoa-Hugo School District Addition/Renovation Project and the school’s reopening in August 2014. “Unstable soils” were determined to be the cause, but earlier efforts to fix solve the problem failed. Based upon CTL Thompson’s recommendations, the school district hired Hayward Baker, a company that specializes in geotechnical construction. Its crew began work last week by boring holes at various levels along the retaining wall as well as down from the top. Reeves explained it may take until spring to determine whether the soils around the retaining wall have stabilized as a result of the work. The current effort to fix the retaining wall is being pushed because the BEST (Build Excellent Schools Today) grant from the Colorado Department of Education (CDE) will expire on December 6. That grant has been paying the majority of the costs for the Genoa-Hugo School District Addition/Renovation Project. Any additional funding requests for the remaining BEST grant money must be submitted prior to that date. In a written report submitted to the board, Quentin Rockwell, the district’s owners representative for the school construction project, said the BEST grant is fully able to cover the current work. In other business during Monday’s meeting, the board members approved the district’s expenditures of $230,011 for the month of October. They also gave their approval to hiring Penny Wilkins as a part-time custodian; the designation of November 11 as a “Snow Day”; and the third and final reading of three revised policies. In addition, Reeves was given the board’s approval to certify the district’s mill levies. They must be certified at the Lincoln County Courthouse by December 9. In her monthly report to the board, Principal Shari Humphrey went through a list of all the recent activities and events at the school. These included: Red Ribbon Week, FFA Fall Carnival, Knowledge Bowl competitions, college visits, Financial Aid Night and a rescheduled Veterans Day event held earlier that day. 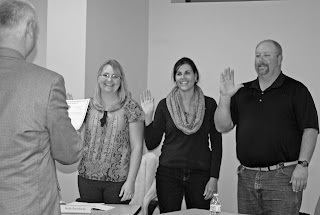 Prior to the start of Monday’s meeting, an official swearing-in ceremony was held for board members Terry Graham, Becky Ravenkamp and Julia Boger. Reeves administered the oath of office. All incumbent candidates, the three board members were scheduled to run in November 3 election. However, when no other candidates stepped forward to challenge them, the school board election was cancelled and they were declared elected. All three will be serving four-year terms of office. After the ceremony, the board reorganized itself. The officer positions approved included: president, Terry Graham; vice president, Becky Ravenkamp; secretary, Bob Kraxberger; treasurer, Rick Lockhart; BOCES representative, Julia Boger; and Accountability representative Bob Kraxberger.